China HGS Real Estate Inc. (“China HGS” or the “Company”), formerly known as China Agro Sciences Corp., is a corporation organized under the laws of the State of Florida. The Company is engaged in real estate development, primarily in the construction and sale of residential apartments, car parks as well as commercial properties. The Company focuses on real estate development in the second-tier and third-tier cities in the People’s Republic of China (“PRC”). The accompanying unaudited condensed consolidated financial statements have been prepared in accordance with generally accepted accounting principles for interim financial information. Accordingly, they do not include all of the information and footnotes required by generally accepted accounting principles for complete financial statements. In the opinion of the management, all adjustments (consisting only of normal recurring accruals) considered necessary for a fair presentation have been included. Operating results for the three months ended December 31, 2009 and 2008 are not necessarily indicative of the results that may be expected for the full years. The information included in this Form 10-Q should be read in conjunction with Management’s Discussion and Analysis of Financial Condition and Results of Operations and the financial statements and notes thereto included in the Company’s Annual Report on Form 10-K for the fiscal year ended September 30, 2009. The balance sheet at September 30, 2009 has been derived from the audited financial statements at that date, but does not necessarily include all of the information and footnotes required by GAAP for the complete financial statements. Certain prior period amounts have been reclassified to conform to the current period presentation. These reclassifications had no effect on reported total assets, liabilities, stockholders’ equity or net income. The consolidated financial statements include the financial statements of the Company, its wholly-owned subsidiaries, China HGS Investment Inc., Shaanxi HGS Management and Consultation Limited Company (“Shaanxi HGS”) and its Variable Interest Entity, Shannxi Guangsha Investment and Development Group Co., Ltd. (“Guangsha”). All inter-company transactions and balances between the Company and its subsidiaries have been eliminated upon consolidation. The preparation of financial statements in conformity with U.S. GAAP (FASB ASC 275-10-50-4) requires management to make estimates and assumptions that affect the amounts reported in the financial statements and accompanying notes, and disclosure of contingent liabilities at the date of the consolidated financial statements. Estimates are used for, but not limited to, the selection of the useful lives of property and equipment, provision necessary for contingent liabilities, fair values, revenue recognition, taxes, budgeted costs and other similar charges. Management believes that the estimates utilized in preparing its consolidated financial statements are reasonable and prudent. Actual results could differ from these estimates. Financial instruments include cash and cash equivalents, restricted cash, accounts receivable, other current assets, short-term loans, accounts payable, customer deposits, other payables, accrued expenses, and taxes payable. The carrying amounts of the above accounts approximate their fair value due to the short term maturities of these instruments. Real estate sales are reported in accordance with the FASB guidance “Accounting for Sales of Real Estate” (formerly referred to as SFAS No. 66). Revenue from the sales of development properties is recognized by the full accrual method at the time of the closing of an individual unit sale. This occurs when title to or possession of the property is transferred to the buyer. A sale is not considered consummated until (a) the parties are bound by the terms of a contract, (b) all consideration has been exchanged, (c) any permanent financing of which the seller is responsible has been arranged, (d) all conditions precedent to closing have been performed, (e) the seller does not have substantial continuing involvement with the property, and (f) the usual risks and rewards of ownership have been transferred to the buyer. Further, the buyer’s initial and continuing investment is adequate to demonstrate a commitment to pay for the property, and the buyer’s receivable, if any, is not subject to future subordination. Sales transactions not meeting all the conditions of the full accrual method are accounted for using the deposit method in which all costs are capitalized as incurred, and payments received from the buyer are recorded as a deposit liability. The Company’s financial information is presented in US dollars. The functional currency of the Company is Renminbi (“RMB”), the currency of the PRC. Transactions at the Company which are denominated in currencies other than RMB are translated into RMB at the exchange rate quoted by the People’s Bank of China prevailing at the dates of the transactions. Exchange gains and losses resulting from transactions denominated in a currency other than that RMB are included in statements of operations as exchange gains. The financial statements of the Company have been translated into U.S. dollars in accordance with Statement of Financial Accounting Standard “Foreign Currency Translation.” The financial information is first prepared in RMB and then is translated into U.S. dollars at period-end exchange rates as to assets and liabilities and average exchange rates as to revenue and expenses. Capital accounts are translated at their historical exchange rates when the capital transactions occurred. The effects of foreign currency translation adjustments are included as a component of accumulated other comprehensive income in shareholders’ equity. Cash includes cash on hand and demand deposits in accounts maintained with state-owned and private banks within the PRC. The Company considers all highly liquid investments with original maturities of three months or less when purchased to be cash equivalents. The Company maintains bank accounts in the PRC. Total cash at December 31 and September 30, 2009 amounted to $1,942,513 and $820,783, respectively, of which no deposits are covered by insurance. The Company has not experienced any losses in such accounts and management believes it is not exposed to any risks on its cash in bank accounts. Loans to outside parties consist of various cash advances to unrelated companies and individuals with which the Company has business relationships. Loans to outside parties are reviewed periodically as to whether their carrying value has become impaired. The Company considers the assets to be impaired if the collectability of the balances becomes doubtful. As of December 31 and September 30, 2009, no allowance for doubtful debts is recorded as all of the loans are considered fully collectible. Real estate property consists of finished residential unit sites, commercial offices and residential unit sites under development. The Company leases the land for the residential unit sites under land use right leases with various terms from the government of China. Real estate property development completed and real estate property under development are stated at the lower of cost or fair value. Expenditures for land development, including cost of land use rights, deed tax, pre-development costs, and engineering costs, exclusive of depreciation, are capitalized and allocated to development projects by the specific identification method. Costs are allocated to specific units within a project based on the ratio of the sales area of units to the estimated total sales area times the total project costs. Costs of amenities transferred to buyers are allocated as common costs of the project that are allocated to specific units as a component of total construction costs. For amenities retained by the Company, costs in excess of the related fair value of the amenity are also treated as common costs. Results of operations of amenities retained by the Company are included in current operating results. In accordance to Statement of Financial Accounting Standards “ Accounting for the Impairment or Disposal of Long-lived Assets” (formerly referred to as “SFAS No. 144”), real estate property development completed and under development are subject to valuation adjustments when the carrying amount exceeds fair value. An impairment loss shall be recognized only if the carrying amount of the assets is not recoverable and exceeds fair value. The carrying amount is not recoverable if it exceeds the sum of the undiscounted cash flows expected to be generated by the assets. Management evaluates, on yearly basis, the impairment of the Company’s real estate developments based on a community level. Each community is assessed as an individual project. The evaluation takes into account of several factors including, but not limited to, physical condition, inventory holding period, management’s plans for future operations, prevailing market prices for similar properties and projected cash flows. Management has determined that there were no impairment losses as of December 31 and September 30, 2009. Any gain or loss on disposal or retirement of a fixed asset is recognized in the profit and loss account and is the difference between the net sales proceeds and the carrying amount of the relevant asset. When property and equipment are retired or otherwise disposed of, the asset and accumulated depreciation are removed from the accounts and the resulting profit or loss is reflected in income. Maintenance, repairs and minor renewals are charged directly to expense as incurred unless such expenditures extend the useful life or represent a betterment, in which case they are capitalized. Recoverability of long-lived assets to be held and used is measured by a comparison of the carrying amount of an asset to the estimated undiscounted future cash flows expected to be generated by the assets. If the carrying amount of an asset exceeds its estimated undiscounted future cash flows, an impairment charge is recognized by the amount by which the carrying amount of the asset exceeds the fair value of the assets. Fair value is generally determined using the asset’s expected future discounted cash flows or market value, if readily determinable. No impairment loss is recorded as of December 31 and September 30, 2009. Advances to vendors consist of balances paid to contractors and vendors for services and materials that have not been provided or received and generally relate to the development and construction of residential units in the PRC. Advances to vendors are reviewed periodically to determine whether their carrying value has become impaired. The Company considers the assets to be impaired if the collectability of the services and materials become doubtful. As of December 31 and September 30, 2009, there was no advance to vendors. Capitalized interest is accounted for in accordance with FASB guidance “Capitalization of Interest Cost” (formerly referred to as SFAS No. 34). For loans to finance projects and provide for working capital, the Company charges the borrowing costs related to working capital loans to interest expense when incurred and capitalize interest costs related to project developments as a component of the project costs. The interest to be capitalized for a project is based on the amount of borrowings related specifically to such project. Interest for any period is capitalized based on the amounts of accumulated expenditures and the interest rate of the loans. Payments received from the pre-sales of units in the project are deducted in the computation of the amount of accumulated expenditures during a period. The interest capitalization period begins when expenditures have been incurred and activities necessary to prepare the asset (including administrative activities before construction) have begun, and ends when the project is substantially completed. Interest Capitalized is limited to the amount of interest incurred. The interest rate used in determining the amount of interest capitalized is the weighted average rate applicable to the project-specific borrowings. However, when accumulated expenditures exceed the principal amount of project-specific borrowings, the Company also capitalizes interest on borrowings that are not specifically related to the project, at a weighted average rate of such borrowings. The Company’s significant judgments and estimates related to interest capitalization include the determination of the appropriate borrowing rates for the calculation, and the point at which capitalization is started and discontinued. Changes in the rates used or the timing of the capitalization period may affect the balance of property under development and the costs of sales recorded. There was no capitalized interest as of December 31 and September 30, 2009. Customer deposits consist of amounts received from customers relating to the sale of residential units in the PRC. In the PRC, customers will generally obtain permanent financing for the purchase of their residential unit prior to the completion of the project. The lending institution will provide the funding to the Company upon the completion of the financing rather than the completion of the project. The Company receives these funds and recognizes them as a current liability until the revenue can be recognized. Other payables consist of balances for non-construction costs with unrelated companies and individuals with which the Company has business relationships. These amounts are unsecured, non-interest bearing and generally are short-term in nature. The Company provides customers with warranties which cover major defects of building structure and certain fittings and facilities of properties sold. The warranty period varies from two years to five years, depending on different property components the warranty covers. The Company constantly estimates potential costs for materials and labor with regard to warranty-type claims expected to be incurred subsequent to the delivery of a property. Reserves are determined based on historical data and trends with respect to similar property types and geographical areas. The Company constantly monitors the warranty reserve and makes adjustments to its pre-existing warranties, if any, in order to reflect changes in trends and historical data as information becomes available. The Company may seek further recourse against its contractors or any related third parties if it can be proved that the faults are caused by them. In addition, the Company also withholds up to 2% of the contract cost from sub-contractors for periods of two to five years. These amounts are included in current liabilities, and are only paid to the extent that there has been no warranty claim against the Company relating to the work performed or materials supplied by the subcontractors. As of December 31 and September 30, 2009, the Company had not recognized any warranty liability or incurred any warranty costs in excess of the amount retained from subcontractors. The Company accounts for income taxes in accordance with FASB ASC 740 “Income Taxes”, (formerly SFAS No. 109, “Accounting for Income Taxes”) and FASB ASC 740-10, (formerly FASB Interpretation No. 48 “Accounting for Uncertainty in Income Taxes, an interpretation of SFAS No. 109”). Deferred tax assets and liabilities are recognized for the expected future tax consequences of events that have been included in the financial statements or income tax returns. Deferred tax assets and liabilities are determined based on the difference between the financial statement and tax basis of assets and liabilities using enacted rates expected to apply to taxable income in the years in which those differences are expected to be recovered or settled. The effect on deferred tax assets and liabilities of a change in tax rates is recognized in income in the period that includes the enactment date. There are no deferred tax amounts for the three months ended December 31, 2009 and 2008. LAT is prepaid on customer deposits and is expensed when the related revenue is recognized. Comprehensive income is defined to include all changes in equity except those resulting from investments by owners and distributions to owners. The Company’s only components of comprehensive income during the three months ended December 31, 2009 and 2008 were net income and the foreign currency translation adjustment. The Company computes earnings per share (“EPS”) in accordance with the ASC 260, “Earnings per share” which requires companies with complex capital structures to present basic and diluted EPS. Basic EPS is measured as net income divided by the weighted average common shares outstanding for the period. Diluted EPS is similar to basic EPS but presents the dilutive effect on a per share basis of potential common shares (e.g., convertible securities, options and warrants) as if they had been converted at the beginning of the periods presented, or issuance date, if later. Potential common shares that have an anti-dilutive effect (i.e., those that increase income per share or decrease loss per share) are excluded from the calculation of diluted EPS. Advertising costs are expensed as incurred, or the first time the advertising takes place, in accordance with Statement of Position No. 93-7 “ Reporting on Advertising Costs.” For the three months ended December 31, 2009 and 2008, the Company recorded advertising expenses of $21,434 and $876, respectively. Financial instruments that potentially subject the Company to concentration of credit risk consist primarily of accounts receivables and other receivables. The Company does not require collateral or other security to support these receivables. The Company conducts periodic reviews of its clients' financial condition and customer payment practices to minimize collection risk on accounts receivables. The Company uses various suppliers and sells to a wide range of customers. No single supplier or customer accounted for more than 10% of revenue or project expenditures for the three months ended December 31, 2008 and 2009. In August 2009, the FASB issued ASU 2009-5, “Fair Value Measurements and Disclosures (Topic 820) – Measuring Liabilities at Fair Value” (“FASB ASU 2009-5”), which provides a single definition of fair value, a framework for measuring fair value, and requires additional disclosure about the use of fair value to measure assets and liabilities. ASU 2009-05 provides clarification for circumstances in which a quoted price in an active market for the identical liability is not available. In such circumstances, a reporting entity is required to measure fair value using one or more of the following techniques: (1) a valuation technique that uses: (a) the quoted price of the identical liability when traded as an asset; or (b) quoted prices for similar liabilities or similar liabilities when traded as assets; or (2) another valuation technique that is consistent with the principles of Topic 820 such as an income approach or a market approach. The guidance provided in ASU 2009-05 is effective for the first reporting period (including interim periods) beginning after issuance. In October 2009, the FASB issued ASU 2009-13, “Revenue Recognition (Topic 605) – Multiple-Deliverable Revenue Arrangements – a Consensus of the FASB Emerging Issues Task Force” (“ASU 2009-13”). ASU 2009-13 addresses the accounting for multiple-deliverable arrangements to enable vendors to account for products or services (deliverables) separately rather than as a combined unit. The amendments in this update will be effective prospectively for revenue arrangements entered into or materially modified in fiscal years beginning on or after June 15, 2010. Early adoption is permitted. The Company is currently evaluating this update. Restricted cash is cash set aside for a particular use or event and is subject to withdrawal restrictions. The Company is required to maintain certain deposits, as restricted cash, with banks that provide mortgage loans to the Company’s customers. These deposits are guarantees for the mortgage loans and are normally equivalent to 5% of the mortgage proceeds paid to the Company. As of December 31 and September 30, 2009, the balances of restricted cash totaled $613,431 and $412,373, respectively. These deposits are not covered by insurance. The Company has not experienced any losses in such accounts and management believes its restricted cash account is not exposed to any risks. Loans to outside parties consist of various cash advances to unrelated companies and individuals with which the Company has business relationships. Starting from the second half of year 2007, the price of building materials in China increased significantly. In order to control the development costs and maintain good relationships with suppliers, the Company makes cash advances to its long-term contractors to support their occasional short-term working capital needs. These advances bear no interest and they are due on demand. As of December 31 and September 30, 2009, the Company had outstanding loans to outside parties in the amount of $3,956,006 and $1,762,022, respectively. All these loans are considered collectible based on the Company’s past experiences. As of December 31 and September 30, 2009, the Company decided no bad debt reserve was necessary. As of December 31 and September 30, 2009, land use rights included in the real estate property under development totaled $13,272,244 and $14,261,781, respectively. Depreciation expense for the three months ended December 31, 2009 and 2008 was $14,246 and $11,344, respectively. Customer deposits are typically funded up to 70%~80% by mortgage loans made by banks to the customers. Until the customer obtains legal title to the property, the banks have a right to seek reimbursement from the Company for any defaults by the customers. The Company, in turn, has a right to withhold transfer of title to the customer until outstanding amounts are fully settled. Interest expense for short term loans totaled $14,752 and $41,571 for the three months ended December 31, 2009 and 2008, respectively. A related party of the Company pledged a land use right in the amount of RMB 7,757,300 (approximately $1.2 million) as collateral for the loan shown above. The Company paid off portion of the loan in the amount of RMB 600,000 by the end of October 2009. Other payables represent contract deposits and bidding deposits that are to be refunded upon completion of the projects or satisfaction of claim-free warranty. There were $1,113,839 and $1,021,147 of other payables as of December 31 and September 30, 2009, respectively. The Company is subject to 5% business sales tax on actual revenue. It is the Company’s continuing practice to recognize 5% of the sales tax on estimated revenue, and file tax return based on the actual result, as the local tax authority may exercise broad discretion in applying the tax amount. As a result, the Company’s accrual sales tax may differ from the actual tax clearance. The Company is governed by the Income Tax Law of the People’s Republic of China concerning the private-run enterprises, which are generally subject to income tax at a new statutory rate of 25%, effective January 1, 2008, on income reported in the statutory financial statements after appropriate tax adjustments. However, as approved by the local tax authority of Hanzhong City, the Company’s CIT was assessed annually at a pre-determined fixed rate as an incentive to stimulate local economy and encourage entrepreneurship. The Company incurred $138,176 and $137,250 income taxes for the three months ended December 31, 2009 and 2008, respectively. Although the possibility exists for reinterpretation of the application of the tax regulations by higher tax authorities in the PRC, potentially overturning the decision made by the local tax authority, the Company has not experienced any reevaluation of the income taxes for prior years. Management believes that the possibility of any reevaluation of income taxes is remote based on the fact that the Company has obtained the written tax clearance from the local tax authority. Thus, no additional taxes payable has been recorded for the difference between the taxes due based on taxable income calculated according to statutory taxable income method and the taxes due based on the fixed rate method. It is the Company’s policy that if such reevaluation of income taxes becomes probable and the amount of additional taxes due can be reasonably estimated, additional taxes shall be recorded in which period the amount can be reasonably estimated and shall not be charged retroactively to an earlier period. Since January 1, 1994, LAT has been applicable at progressive tax rates ranging from 30% to 60% on the appreciation of land values, with an exemption provided for the sales of ordinary residential properties if the appreciation values do not exceed certain thresholds specified in the relevant tax laws. However, the Company’s local tax authority in Hanzhong City has not imposed the regulation on real estate companies in its area of administration. Instead, the local tax authority has levied the LAT at the rate of 0.8% or 1.0% against total cash receipts from sales of real estate properties, rather than according to the progressive rates. For the three months ended December 31, 2009 and the fiscal year ended September 30, 2009, the Company has made full payment for LAT with respect to properties sold in accordance with the requirements of the local tax authorities. Prior to the Share Exchange, the Company had 20,050,000 shares of common stock issued and outstanding at $.001 per share. Before the closing of the Share Exchange transaction, the Company retired 14,000,000 shares of common stock in connection with the spin-off of Dalian Holding. In connection with the Share Exchange consummated on August 31, 2009, the Company issued 14,000,000 shares of its common stock to HGS shareholder and additional 25,000,000 shares to the management team of Guangsha. As a result of the reverse merger, the equity account of the Company, prior to the share exchange date, has been retroactively restated so that the ending outstanding share balance as of the share exchange date is equal to the number of post share-exchange shares. As of December 31, 2009, there were a total of 45,050,000 shares of the Company’s common stock issued and outstanding. As of December 31, 2009, the total additional paid-in capital account amounted to $17,632,348. The Company is required to make appropriations to reserve funds, comprising the statutory surplus reserve and discretionary surplus reserve, based on after-tax net income determined in accordance with generally accepted accounting principles of the PRC (“PRC GAAP”). Appropriations to the statutory surplus reserve is required to be at least 10% of the after tax net income determined in accordance with PRC GAAP until the reserve is equal to 50% of the entities’ registered capital. Appropriations to the discretionary surplus reserve are made at the discretion of the Board of Directors. The statutory surplus reserve fund is non-discretionary other than during liquidation and can be used to fund previous years’ losses, if any, and may be utilized for business expansion or converted into share capital by issuing new shares to existing shareholders in proportion to their shareholding or by increasing the par value of shares currently held by them, provided that the remaining statutory surplus reserve balance after such issue is not less than 25% of the registered capital before the conversion. Pursuant to the Company’s articles of incorporation, the Company is to appropriate 10% of its net profits as statutory surplus reserve. As of December 31 and September 30, 2009, the balance of statutory surplus reserve was $2,330,259. The discretionary surplus reserve may be used to acquire fixed assets or to increase the working capital to expend on production and operation of the business. The Company’s Board of Directors decided not to make an appropriation to this reserve for the quarter ended December 31, 2009. In August 2009, the Company entered into share exchange transaction which has been accounted for as a reverse merger under the purchase method of accounting since there has been a change of control. The Company computes the weighted-average number of common shares outstanding in accordance with FAS 141(R), which states that in calculating the weighted average shares when a reverse merger takes place in the middle of the year, the number of common shares outstanding from the beginning of that period to the acquisition date shall be computed on the basis of the weighted-average number of common shares of the legal acquiree (the accounting acquirer) outstanding during the period multiplied by the exchange ratio established in the merger agreement. The number of common shares outstanding from the acquisition date to the end of that period shall be the actual number of common shares of the legal acquirer (the accounting acquiree) outstanding during that period. As a industry practice, the Company provides guarantees to PRC banks with respect to loans procured by the purchasers of the Company’s real estate properties for the total mortgage loan amount until the completion of the registration of the mortgage with the relevant mortgage registration authorities, which generally occurs within six to twelve months after the purchasers take possession of the relevant properties. The mortgage banks require the Company to maintain, as restricted cash, 5% to 10% of the mortgage proceeds as security for the Company’s obligations under such guarantees. If a purchaser defaults on its payment obligations, the mortgage bank may deduct the delinquent mortgage payment from the security deposit and require the Company to pay the excess amount if the delinquent mortgage payments exceed the security deposit. The Company has made necessary reserves in its restricted cash account to cover any potential mortgage default as required by mortgage lenders. The Company has not experienced any losses related to this guarantee and believes that such reserves are sufficient. As required by ASC Topic 855 “Subsequent Events,” the Company has evaluated subsequent events that have occurred through February 8, 2010, the date the consolidated financial statements were available to be issued. The only subsequent event is described below. On January 6, 2010, the Board of Directors of the Company appointed Gordon H. Silver, H. David Sherman, Yuankai Wen and Shenghuei Luo as directors of the Company, effective immediately. In connection with the appointment, the Company has agreed to pay (i) Mr. Silver an annual compensation in the amount of $24,000 and option to purchase up to 12,000 shares of the Company’s common stock, (ii) Mr. Sherman an annual compensation in the amount of $36,000 and option to purchase up to 12,000 shares of the Company’s common stock and (iii) Mr. Wen an annual compensation in the amount of 100,000RMB and option to purchase up to 10,000 shares of the Company’s common stock. These stock options will become exercisable as to 20% of the original number of Shares on the Grant Date and 10% of the Shares at the end of every quarter thereafter. The exercise price of such options is $2.60 per share and such options will expire on January 6, 2015. These options are exercisable at $2.6 per share for a term of five years and had tiered vesting provisions. The following discussion should be read in conjunction with the Condensed Consolidated Financial Statements and notes thereto included in this Quarterly Report on Form 10-Q, or this Quarterly Report, and in conjunction with our Annual Report on Form 10-K for the fiscal year ended September 30, 2009. Certain of these statements, including, without limitation, statements regarding the extent and timing of future revenues and expenses and customer demand, statements regarding the deployment of our products, statements regarding our reliance on third parties and other statements using words such as “anticipates,” “believes,” “could,” “estimates,” “expects,” “intends,” “may,” “plans,” “should,” “will” and “would,” and words of similar import and the negatives thereof, constitute forward-looking statements. These statements are predictions based upon our current expectations about future events. Actual results could vary materially as a result of certain factors, including but not limited to, those expressed in these statements. We refer you to the “Risk Factors,” “Results of Operations,” “Disclosures About Market Risk,” and “Liquidity and Capital Resources” sections contained in this Quarterly Report, and the risks discussed in our other Securities Exchange Commission, or SEC, filings, which identify important risks and uncertainties that could cause actual results to differ materially from those contained in the forward-looking statements. We urge you to consider these factors carefully in evaluating the forward-looking statements contained in this Quarterly Report. All subsequent written or oral forward-looking statements attributable to our company or persons acting on our behalf are expressly qualified in their entirety by these cautionary statements. The forward-looking statements included in this Quarterly Report are made only as of the date of this Quarterly Report. We do not intend, and undertake no obligation, to update these forward-looking statements. We conduct substantially all of our business through Shaanxi Guangsha Investment and Development Group Co., Ltd., in Hanzhong, Shaanxi Province. All of our businesses are conducted in mainland China. We were founded by Mr. Xiaojun Zhu, our Chairman and Chief Executive Officer and commenced operations in 1995 in Hanzhong, a prefecture-level city of Shaanxi Province. Since the initiation of our business, we have been focused on expanding our business in certain Tier 2 cities in China which we strategically selected based on a set of criteria. Our selection criteria includes population and urbanization growth rate, general economic condition and growth rate, income and purchasing power of resident consumers, anticipated demand for private residential properties, availability of future land supply and land prices and governmental urban planning and development policies. As of December 31, 2009, we have established operations in two Tier 2 cities and one county in Hanzhong City, Shaanxi Province, comprising of downtown area and west ring road in the city of Hanzhong, city of Weinan, a municipality in Shaanxi Province, and Yang County. We are a fast-growing residential real estate developer that focuses on Tier 2 cities in China. We utilize a standardized and scalable model that emphasizes rapid asset turnover, efficient capital management and strict cost control. According to datas from Shanxi Hantai Statistics Brochure, the Company is currently ranked No.1 among all property developers in the city of Hanzhong in terms of market shares and contracted sales of residential units for the years of 2009 and 2008, according to statistics prepared by the Bureau of Real Estate Management in Hanzhong. Since 2001, we have planned to expand into strategically selected Tier 2 cities and some counties with real estate development potential in Shaanxi Province, and expect to benefit from rising residential housing demand as a result of increasing income levels of consumers and growing populations. We intend to continue our expansion into additional selected Tier 2 cities and counties as suitable opportunities arise. We will expand to more select targeted Tier 2 cities including cities in Sichuan Province and other Tier 2 cities in Shaanxi Province which we are surveying for expansion in the near future. China HGS Real Estate Inc. (the “Company” or “China HGS”), formerly known as China Agro Sciences Corp., is a corporation organized under the laws of the State of Florida. On August 21, 2009, the Company entered into a Share Exchange Agreement (“Share Exchange”) by and among the Company, China HGS Investment Inc. (“HGS Investment”), a corporation formed under the laws of the State of Delaware, and Rising Pilot, Inc., a British Virgin Island business company which owns 100% issued and outstanding capital stock of HGS Investment (the “HGS Shareholder”). The closing of the Share Exchange transaction occurred on August 31, 2009. Pursuant to the Share Exchange Agreement, the HGS Shareholder transferred and assigned to the Company all of the issued and outstanding capital stock of HGS Investment in exchange for the issuance of a total of 14,000,000 shares of the Company’s common stock with $0.001 par value. As a result of this Share Exchange, HGS Investment becomes a wholly-owned subsidiary of the Company. In addition, as a part of the Share Exchange transaction, the Company entered into an entrusted management agreement (the “Entrusted Management Agreement”) with the management of Shaanxi Guangsha Investment and Development Group Co., Ltd. (“Guangsha”) and issued to Mr. Zhu Xiaojun, CEO of Guangsha and his management team an aggregate of 25,000,000 shares of common stock of the Company. Prior to and in conjunction with the consummation of the Share Exchange, the Company also entered into certain purchase and sale agreement with Mr. Zhengquan Wang, the Company’s CEO prior to the close of the Share Exchange, to spin out the business and operations of Dalian Holding Corp. (“Dalian Holding”), a Florida corporation and a wholly-owned subsidiary of the Company (the “Spin-Out”), including substantially all the assets and liabilities of Dalian Holding (the “Legacy Business”). Pursuant to such agreement, Mr. Wang shall return 14,000,000 shares of the Company’s common stock within ninety (90) days of the Closing of the Share Exchange for the exchange of current Dalian Holding assets and assume all the liabilities of Dalian Holding relating to the Legacy Business, and the Company shall be released from any and all claims whatsoever with regard to such liabilities, whether such claim is known or unknown to Dalian Holding on the date hereof. Prior to the Share Exchange, on August 29, 2009, the Company also completed the spin-off of all its assets and liabilities to Dalian Holding Corp. so the only material asset of the Company following the Share Exchange is the ownership of HGS Investment. As a result of the Share Exchange transaction, the shareholders of Guangsha now own the majority of the equity in the Company. In addition, the original officers and directors of the Company resigned from their positions and new directors and officers affiliated with Guangsha were appointed ten days after the notice pursuant to Rule 14f-1 had been mailed to the shareholders of record. The transaction has been accounted for as a reverse merger under the purchase method of accounting since there has been a change of control. Accordingly, HGS Investment and its subsidiaries will be treated as the continuing entity for accounting purposes. HGS Investment is a holding company incorporated under the law of the State of Delaware on July 17, 2008. 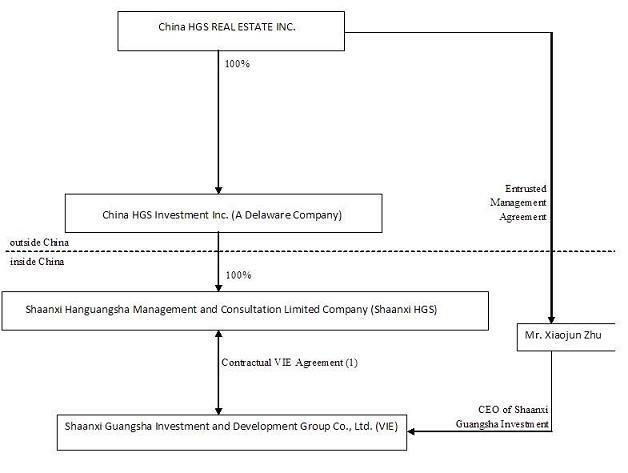 HGS Investment owns 100% of the equity interest of Shaanxi Hanguangsha Management and Consultation Limited Company (“Shaanxi HGS”), a wholly foreign-owned entity incorporated under the laws of the People’s Republic of China (“PRC” or “China”) on June 3, 2009. China HGS does not conduct any substantive operations of its own. Instead, through its subsidiary, Shaanxi HGS, it had entered certain exclusive contractual agreements with Shaanxi Guangsha Investment and Development Group Co., Ltd. (“Guangsha”), a company incorporated in Hanzhong City, Shaanxi Province, China in November 2007. Pursuant to these agreements, Shaanxi HGS is obligated to absorb a majority of the risk of loss from Guangsha’s activities and entitles it to receive a majority of its expected residual returns. In addition, Guangsha’s shareholders have pledged their equity interest in Guangsha to Shaanxi HGS, irrevocably granted Shaanxi HGS an exclusive option to purchase, to the extent permitted under PRC Law, all or part of the equity interests in Guangsha and agreed to entrust all the rights to exercise their voting power to the person(s) appointed by Shaanxi HGS. Through these contractual arrangements, the Company and Shaanxi HGS hold all the variable interests of Guangsha, and the Company and Shaanxi HGS have been determined to be the most closely associated with Guangsha. Therefore, our Company is the primary beneficiary of Guangsha. Based on these contractual arrangements, we believe that Guangsha should be considered as Variable Interest Entity (“VIE”) under ASC 810 “Consolidation of Variable Interest Entities, an Interpretation of ARB No. 51,” because the equity investors in Guangsha no longer has the characteristics of a controlling financial interest and the Company through Shaanxi HGS is the primary beneficiary of Guangsha. Accordingly, management believes that Guangsha should be consolidated under ASC 810. Our Company, along with our subsidiaries and VIE, is now engaging in real estate development, primarily in the construction and sale of residential apartments, car parks as well as commercial properties. We currently operate in three local markets in Shaanxi Province — downtown area of Hanzhong, city of Weinan, and Yang county in Hanzhong City. (1) Calculated by square meters (1 square meter = 10.7 square feet). for properties that are under planning, the stated GFA is based on the land grant contract and our internal projection. We intend to seek attractive opportunities to expand into additional Tier 2 cities and counties. Our selections are based on certain criteria, including economic growth, per capita income, population, urbanization rate as well as availability of suitable land supply and local residential property market conditions. In China, the supply of land is controlled by the government. Since early 2000s, the real estate industry in China has been transitioning from an arranged system controlled by the PRC government to a more market-oriented system. At present, although the Chinese government still owns all urban land in China, the land use rights with terms up to 70 years can be granted to, and owned or leased by, private individuals and companies. Generally, there are two ways the Company usually applies to acquire the land use right. Purchase by auction held by court under bankruptcy proceedings. In 2005, the Company acquired the land lease of a bankrupted company, Weinan Chemical Company which covers an area of 80 acres. After the acquisition, the Company started the construction of Lijing Garden Projects and finished all 3 projects of Lijing Garden in June 2008. In May 2008, the Company successfully acquired a land lease covering 236 acres through bidding on an auction held by the local Land Consolidation and Rehabilitation Center of Yang County. After the acquisition, the Company started the construction of Yangzhou Pearl Garden Projects on the acquired land lease, and as of December 31, 2009, most of the projects of Yangzhou Pearl Garden were still under construction. In July 2008, the Company acquired the land lease of another bankrupt company, Hanzhong Energy Company which covers an area of 30 acres in Hanzhong City. After the acquisition, the Company started the construction of Mingzhu Qinju Garden Projects on the acquired land lease, and as of December 31, 2009, all projects of Qinju Garden were still under construction. In 2009, the Company successfully acquired another parcel of leased-land covering 180 acres through bidding on an auction held by the local Land Consolidation and Rehabilitation Center of Hanzhong City. After the acquisition, the Company started the construction of Mingzhu Garden Projects on the acquired land lease, and as of December 31, 2009, most of the projects of Mingzhu Garden were still under construction. All such purchases of land are required to be reported to and authorized by the Xi’an Bureau of Land and Natural Resources. As to the real estate project design and construction services, the Company typically selects the lowest-cost provider based on quality ensured through an open bidding process. Such service providers are numerous in China and the Company foresees no difficulties in securing alternative sources of services as needed. The real estate industry in China is highly competitive. In Tier 2 cities that we focus on the markets are relatively more fragmented than Tier I cities. We compete primarily with local and regional property developers and an increasing number of large national property developers who have also started to enter these markets. Competitive factors include the geographical location of the projects, the types of products offered, brand recognition, price, designing and quality. In the regional markets which we operate, our major competitors include Wanbang Real Estate Development Co. Ltd., and other national real estate developers who have also started their projects in the local markets. Nationally, there are numerous companies that have real estate projects across China. There are 79 housing and land development companies listed on the Shanghai, Shenzhen and Hong Kong Stock Exchanges. However, such companies usually undertake large scale projects and are unlikely to compete with Guangsha for business as the Company targets small to medium sized projects in Tier 2 cities and counties. In the regional market, the Company’s only direct competitor with meaningful market shares in the market is Wanbang Real Estate Development Co. Ltd. This company generally undertakes medium and small scale projects and focuses on development of commercial real estate properties, such as hotels and shopping centers. By the end of December, 2009, Wanbang had developed realty about 600 acres across Hangzhong City and other counties surrounding. As of December 31, 2009, Wanbang had about 200,000 square meters of construction area. We emphasize quality control to ensure that our buildings and residential units meet our standards and provide high quality service. We select only experienced design and construction companies. We, through our contracts with construction contractors, provide customers with warranties covering the building structure and certain fittings and facilities of our property developments in accordance with the relevant regulations. To ensure construction quality, our construction contracts contain quality warranties and penalty provisions for poor work quality. In the event of delay or poor work quality, the contractor may be required to pay pre-agreed damages under our construction contracts. Our construction contracts do not allow our contractors to subcontract or transfer their contractual arrangements with us to third parties. We typically withhold 2% of the agreed construction fees for two to five years after completion of the construction as a deposit to guarantee quality, which provides us assurance for our contractors’ work quality. Our contractors are also subject to our quality control procedures, including examination of materials and supplies, on-site inspection and production of progress reports. We require our contractors to comply with relevant PRC laws and regulations, as well as our own standards and specifications. We set up a profile for each and every unit constructed and monitor the quality of such unit throughout its construction period until its delivery. We also employ independent surveyors to supervise the construction progress. In addition, the construction of real estate projects is regularly inspected and supervised by the PRC governmental authorities. As a developer of property in the PRC, we are subject to various environmental laws and regulations set by the PRC national, provincial and municipal governments. These include regulations on air pollution, noise emissions, as well as water and waste discharge. We, in the past, have never paid any penalties associated with the breach of any such laws and regulations. Compliance with existing environmental laws and regulations has not had a material adverse effect on our financial condition and results of operations, and we do not believe it will have such an impact in the future. Our projects are normally required to undergo an environmental impact assessment by government-appointed third parties, and a report of such assessment needs to be submitted to the relevant environmental authorities in order to obtain their approval before commencing construction. Upon completion of each project, the relevant environmental authorities inspect the site to ensure the applicable environmental standards have been complied with, and the resulting report is presented together with other specified documents to the relevant construction administration authorities for their approval and record. Approval from the environmental authorities on such report is required before we can deliver our completed work to our customers. In the past, we have not experienced any difficulties in obtaining those approvals for commencement of construction and delivery of completed projects. We currently have 87 full-time staff and employees. In line with the provisions of FASB guidance “Accounting for Sales of Real Estate,” we recognize revenue from the sale by the full accrual method at the time of the closing of each individual unit sale. This occurs when title to or possession of the property is transferred to the buyer. Our revenues are all derived from our sale of real estate. Real estate sales represent revenues from the sales of properties we developed. Sales tax is a one-time tariff which consists of a business tax at the rate of 5%, an urban construction tax at the rate of 7% and an education surcharge at the rate of 3%. Our continuing practice is to recognize the sales tax on estimated revenue, and file tax return based on the actual result, as the local tax authority may exercise broad discretion in applying the tax amount. As a result, our accrual sales tax may differ from the actual tax clearance. Total sales tax amounted to $663,246 and $525,725 for the three months ended December 31, 2009 and 2008, respectively, representing an increase of 26.16% from year to year, mainly because of the increase of our revenue. Revenues increased by 18.40% to approximately $10.4 million for the three months ended December 31, 2009 from approximately $8.8 million for the three months ended December 31, 2008. The $1.6 million increase was mainly attributable to several reasons, including (1) the Company strengthened its advertising and sales promotion activities during the first quarter in 2010 than in prior comparative period; (2) the Company’s enhanced brand name and high quality product has won consumers’ confidence and trust; (3) the increase in local residents’ disposal income has stimulated the great market demand for new residential units in China’s Tier 2 and Tier 3 cities, where the Company is competing and focusing; and (4) the Company has developed several new projects and sold to a wider variety of customers during the quarter, which has broadened the sales touch point with the buyers and exposed the Company to more sales opportunities. The following table sets forth a breakdown of our cost of revenues for the periods indicated. Our cost of real estate sales consists primarily of the cost of land use rights and construction cost. Costs of real estate sales are capitalized and allocated to development projects using the specific identification method. Costs are recorded based on the ratio of the sales value of the relevant units completed and sold to the estimated total project sales value, multiplied by the total project costs. Cost of sales was approximately $5.6 million for the three months ended December 31, 2009 compared to $4.8 million for the three months ended December 31, 2008. The $0.76 million increase in cost of sales was mainly attributable to the increased sales of our real estate property, especially the costs associated with the increased sales in Yangzhou Pearl Garden. Land use rights costs: Land use rights costs include the land premium we pay to acquire land use rights for our property development sites, plus taxes. Our land use rights costs vary for different projects according to the size and location of the site and the minimum land premium set for the site, all of which are influenced by government policies, as well as prevailing market conditions. Our land use rights costs for the three months ended December 31, 2009 is $921,051.8, representing an decrease of $258,343 or 21.9% compared to that of the three months ended December 31, 2008. The decrease in our land use rights was primarily because we acquired the land use lease at a lower price through a favorable auction bid process supported by our local government than we did for the prior comparative period. For the past several years, our land use rights costs have been steadily increasing due to rising property prices in Hanzhong City and increased competition from other bidders at government land auctions. In order to control our costs and maintain competitive advantages, we have been trying to acquire the land use lease at favorable prices and keep as much the land reserve as we can whenever such opportunities emerged. Construction costs: We outsource the construction of all of our projects to third party contractors, whom we select through a competitive tender process. Our construction contracts provide a fixed payment which covers substantially all labor, materials, equipment costs, subject to adjustments for some types of excess, such as design changes during construction or changes in government-suggested steel prices. Our construction costs consist primarily of the payments to our third-party contractors, which are paid over the construction period based on specified milestones. In addition, we purchase and supply a limited range of fittings and equipment, including elevators, window frames and door frames. Our construction costs for the three months ended December 31, 2009 is $4,631,538, representing an increase of $1,034,494 or 28.76% compared to that of the three months ended December 31, 2008. The increase in our construction costs for the three months ended December 31, 2009 was primarily due to increased raw material prices and direct labor costs as compared to the same period in 2008. Although the total cost of real estate sales increased by 28.76% or $776,151 to $5,552,590 for the three months ended December 31, 2009, compared to $4,776,439 of the three months ended December 31, 2008, the total cost of sales as a percentage of revenue for the three months ended December 31, 2009 basically remains stable compared to that of the prior year. Gross profit was approximately $4.8 million for the three months ended December 31, 2009 compared to $4.0 million for the three months ended December 31, 2008, an increase of $0.8 million attributed to our increased sales revenue. Our overall gross profit as a percentage of revenues increased to 46.56% in the three months ended December 31, 2009 compared to 45.58% in the comparable period in prior year mainly due to our strict cost control. The gross margin of our projects is normally in the range of 40% to 55%. The increase of our gross margin was primarily due to our cost control. Selling and distribution expenses increased by $169,128, or 130.15%, to $299,081 for the three months ended December 31, 2009 from $129,953 for the three months ended December 31, 2008. The increase in selling and distribution expenses was attributable to our increased advertising expenses incurred for the quarter ended December 31, 2009 to enhance our brand name image and promote our sales of residential units in Yangzhou Pearl Garden. The increase in our selling and distribution expenses was also affected by our increased salary, sales commissions and annual bonus expenses incurred in line with our increased sales volume. Our selling and distribution expenses were lower in the prior comparative period because we relied mainly on our own sales force which allowed us to effectively manage our marketing expenses level and we granted fewer bonuses to our employees in that period. During the three months ended December 31, 2009, in addition to using our own marketing force, we have also taken advantage of outsourced marketing efforts to introduce our properties located in Yang County, in an effort to broaden the local awareness of our brand and to gain more public acceptance in the region. As of December 31, 2009 we employed more than 60 full time sales and marketing personnel including 45 representing our properties in the city of Hanzhong, 10 representing properties in Yang County and 5 representing properties in Weinan. We expect our selling and marketing expense to increase in the near future as we increase our sales efforts, launch more projects and target new markets to expand our operations. For the three months ended December 31, 2009, our general and administrative expenses were $817,230, representing an increase of $648,756 or 385%, as compared to the general and administrative expenses for the three months ended December 31, 2008. The increase is primarily due to the expenses incurred in connection with our company’s going public and related consulting services, as well as salary and annual bonus expenses incurred in support of our increased sales activities during the first quarter of fiscal year 2010. We expect that general and administrative expenses will increase as we expand our business and operations, especially when we launch more development projects and expand our business into nearby areas. In addition, as a result of the Company’s shares of common stock being quoted on the Over-the-Counter Bulletin Board, the Company will need to enhance its management’s skills and levels to adapt to the complex business environment because it will be subject to the rules and regulations of United States securities laws and corporate governance and internal controls. We believe that we will need to hire more personnel as our business continues to grow, and we believe that we will need to incur additional general and administrative costs in the near future. Net interest expense was $14,752 for the three months ended December 31, 2009 compared to $41,571 for the three months ended December 31, 2008, representing a 64.51% decrease. The decrease of net interest expense for the three months ended December 31, 2009 was because the Company repaid portion of its short-term loans back to the bank during this quarter. The Company is governed by the Income Tax Law of the People’s Republic of China concerning the private-run enterprises, which are generally subject to tax at a new statutory rate of 25% on income reported in the statutory financial statements after appropriate tax adjustments. However, as approved by the local tax authority of Hanzhong City, the Company’s corporate income tax was assessed annually at a pre-determined fixed rate as an incentive to stimulate local economy and encourage entrepreneurship. Currently, our income taxes are assessed at only 3.7% on our taxable income, instead of statutory rate of 25%. As a result, income tax expenses for the three months ended December 31, 2009 was $138,176, representing a 0.67% increase as compared to $137,250 for the three months ended December 31, 2008. The increase was a result of our higher realized taxable income. We realized $3,569,028 in net income for the three months ended December 31, 2009, a 1.33% or $46,681 increase as compared to $3,522,347 for the three months ended December 31, 2008. The increase in our net income was primarily due to our increased sales revenue and effective cost management for the respective periods. We expect to experience the ongoing positive trend in our financial performance to continue through fiscal year 2010. We operate primarily in the PRC and the functional currency of our operating subsidiary is the Chinese Renminbi (”RMB”). The RMB is not freely convertible into foreign currency and all foreign exchange transactions must take place through authorized institutions. No representation is made that the RMB amounts could have been, or could be, converted into USD at the rates used in translation. Translation adjustments resulting from this process amounted to $1,136 and $978 for the three months ended December 31, 2009 and 2008, respectively. The balance sheet amounts with the exception of equity at December 31, 2009 were translated at 6.8372 RMB to 1.00 USD as compared to 6.8542 RMB to 1.00 USD at December 31, 2008. The equity accounts were stated at their historical rate. The average translation rates applied to the income statements accounts for the periods ended December 31, 2009 and 2008 were 6.836 RMB and 6.8532 RMB, respectively. To date, we have financed our operations primarily through cash flows from operations, borrowings from banks are limited. Our total current liabilities as of September 30, 2009 amounted to $18.837 million, representing a 0.032% increase as compared to $18.831 million in prior fiscal year. The increase in our current liabilities was affected by the increase in accrued expenses from $125,742 at September 30, 2009 to $763,948 as of December 31, 2009. The increase in our accrued expenses for the quarter ended December 31, 2009 was because we accrued the annual bonus which is an award to be paid to our employees as an incentive to motivate them for greater endeavors in the fiscal year 2010 and beyond. These accrued expenses will be paid before the Chinese Spring Festival. Based on our current operating plan, we believe that existing cash and cash equivalents balances, as well as cash forecast by management to be generated by operations will be sufficient to meet our working capital and capital requirements for our current operations. Net cash provided by operating activities during the three months ended December 31, 2009 amounted to $1,209,643, which consists of our net income of $3,569,028, adds back noncash adjustments of $17,107 and offset by net changes in operating assets and liabilities due to our expanded operating activities, including increase in our restricted cash of $201,068 affected by increased sales and required by banks that provided mortgage loans to our customers , increase in our loans to outside parties of $2,194,256 in order to maintain good relationship with these material suppliers, increase of our real estate property completed of $3,676,043 due to several of our construction projects have been completed as scheduled,,, decrease of our real estate property under development of $3,618,875 because several of our projects have been completed as of December 31, 2009 and accordingly have been transferred into inventory account decrease of advance from customers in the amount of $1,095,034 which was attributable to increased sales resulted in recognition of the related amounts as revenues after meeting all conditions of revenue recognition method. Net cash used in operations during the three months ended December 31, 2008 totaled $2,080,627, which consists of our net income of $3,522,347, adds back noncash adjustments of $11,653 and offset by net changes in operating assets and liabilities due to our expanded operating activities, including decrease in our restricted cash of $54,436, increase in our loans to outside parties of $350,664 in order to maintain good relationship with these material suppliers, decrease of our real estate property completed of $4,776,439 because our increased sales during this period reduced our inventory balance, increase of our real estate property under development of $2,533,239 because several of our new construction projects have been launched during this period of time which increased our expenditures in land costs and relevant construction costs, and a decrease of advance from customers in the amount of $6,788,087 which was attributable to recognition of the related amounts as revenues after meeting all conditions of revenue recognition method. Net cash provided by operating activities at December 31, 2009 increased by $3,290,888 or 158.12% compared to the same period of 2008. Net cash flows used in financing activities amounted to $87,770 in the three months ended December 31, 2009, which consist of repayment of our short-term bank loan by $87,770. Cash flows provided by financing activities amounted to $850,111 in the three months ended December 31, 2008, which consist of proceeds from shareholder loan of $412,360 and shareholder’s capital contribution in the amount of $437,750. Cash flows used in financing activities for the three months ended December 31, 2009 decreased by $937,882 or 110.32% compared to the same period in 2008. As of the date of this report, we do not have any off-balance sheet arrangements that have or are reasonably likely to have a current or future effect on our financial condition, changes in financial condition, revenues or expenses, results of operations, liquidity, capital expenditures or capital resources that are material to investors. The term “off-balance sheet arrangement” generally means any transaction, agreement or other contractual arrangement to which an entity unconsolidated with us is a party, under which we have: (i) any obligation arising under a guarantee contract, derivative instrument or variable interest; or (ii) a retained or contingent interest in assets transferred to such entity or similar arrangement that serves as credit, liquidity or market risk support for such assets. See “Note 2. Summary of Significant Accounting Policies” in “Item 1. Financial Statements” herein for a discussion of the critical accounting pronouncements adopted in this Quarterly Report on Form 10-Q. See “Note 2. Summary of Significant Accounting Policies” in “Item 1. Financial Statements” herein for a discussion of the new accounting pronouncements adopted in this Quarterly Report on Form 10-Q. Under the supervision and with the participation of our management, including our Chief Executive Officer and Chief Financial Officer, we conducted an evaluation of the effectiveness of the design and operation of our disclosure controls and procedures, as defined in Rules 13a-15(e) and 15d-15(e) under the Securities Exchange Act of 1934, as amended, as of the end of the period covered by this Quarterly Report on Form 10-Q (the “Evaluation Date”). The evaluation of our disclosure controls and procedures included a review of our processes and the effect on the information generated for use in this Quarterly Report on Form 10-Q. In the course of this evaluation, we sought to identify any material weaknesses in our disclosure controls and procedures and to confirm that any necessary corrective action, including process improvements, was taken. The purpose of this evaluation is to determine if, as of the Evaluation Date, our disclosure controls and procedures were operating effectively such that the information, required to be disclosed in our Securities and Exchange Commission (“SEC”) reports (i) was recorded, processed, summarized and reported within the time periods specified in SEC rules and forms, and (ii) was accumulated and communicated to our management, including our Chief Executive Officer and Chief Financial Officer, as appropriate to allow timely decisions regarding required disclosure. As of December 31, 2009, the Company’s Chief Executive Officer and its Chief Financial Officer have concluded that, as of that date, the Company’s controls and procedures were not effective due to some significant deficiencies (as defined in Public Company Accounting Oversight Board Standard No. 2) in the Company’s internal controls over financial reporting. This is due to the fact that the Company lacks sufficient personnel with the appropriate level of knowledge, experience and training in the application of US generally accepted accounting principals (“GAAP”) standards, especially related to complicated accounting issues. This could cause the Company to be unable to fully identify and resolve certain accounting and disclosure issues that could lead to a failure to maintain effective controls over preparation, review and approval of certain significant account reconciliation from Chinese GAAP to US GAAP and necessary journal entries. The Company has relatively small number of professionals employed by the Company in bookkeeping and accounting functions, which prevents the Company from appropriately segregating duties within its internal control systems. The inadequate segregation of duties is a weakness because it could lead to the untimely identification and resolution of accounting and disclosure matters or could lead to a failure to perform timely and effective reviews. We are evaluating the roles of our existing accounting personnel in an effort to realign the reporting structure of our internal auditing staff in China that will test and monitor the implementation of our accounting and internal control procedures. We are in the process of completing a review and revision of the documentation of the Company’s internal control procedures and policies. We will begin implementation an initiative and training in China to ensure the importance of internal controls and compliance with established policies and procedures are fully understood throughout the organization and will provide additional U.S. GAAP training to all employees involved with the performance of or compliance with those procedures and policies. We will implement a formal financial reporting process that includes review by our Chief Executive Officer and the full Board of Directors of financial statements prior to filing with the SEC. We will increase our accounting and financing personnel resources, by retaining more U.S. GAAP knowledgeable financial professionals. The remedial measures being undertaken may not be fully effectuated or may be insufficient to address the significant deficiencies we identified, and there can be no assurance that significant deficiencies or material weaknesses in our internal control over financial reporting will not be identified or occur in the future. If additional significant deficiencies (or if material weaknesses) in our internal controls are discovered or occur in the future, among other similar or related effects: (i) the Company may fail to meet future reporting obligations on a timely basis, (ii) the Company’s consolidated financial statements may contain material misstatements, (iii) the Company’s business and operating results may be harmed. Based on this evaluation, our Chief Executive Officer and Chief Financial Officer concluded that, as of the Evaluation Date, our disclosure controls and procedures were not operating effectively. There were no changes in our internal control over financial reporting during the quarter ended December 31, 2009 that materially affected, or are reasonably likely to materially affect, our internal control over financial reporting.